My garden is filled with tasty Organic fruit and vegetables at the moment. 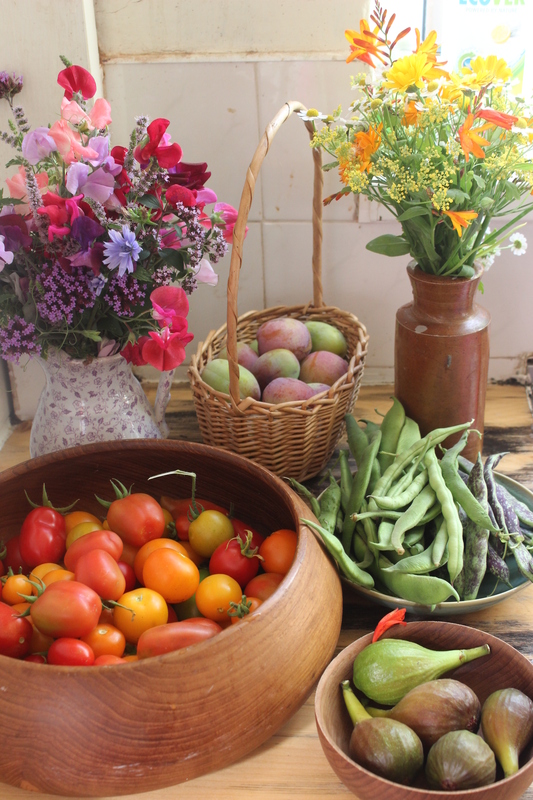 I am trying to keep pace with harvesting, cooking and eating it! I have decided that for August I will be kind to myself, honour these lazy summer days with my children and give myself simple goals. For the Permaculture Principle of ‘Catch and store energy’ I will look only at two things. 1. Catching and storing the energy produced in my garden by making jams and pickles, freezing fruits, drying tomatoes and harvesting/eating everything that I can manage to! I have always been quite good at planning and maintaining my garden but for some reason, I often fall down on the harvesting and using of my produce. I have put a lot of effort into producing an abundant plot this year, so I am determined that nothing will go to waste. I am keeping up with my ‘what I ate from the garden today’ diary and this has been a good tool for focusing my mind on harvesting little and often. 2. My second goal is to catch and store my own energy. My life is super busy. I have three children, a husband, family nearby, friends to keep up with, my diploma to work on, Muddy Boots to run, volunteering jobs to maintain, various animals to care for, a rambling garden to tend to and a household to set the agenda for. Phew! Some weeks it feels like I am juggling far too many plates and sometimes I do come crashing to the ground. So, this month I will focus on relaxing, letting things go, having fun and getting some rest. With that in mind my blog will probably be a little quiet this month too. I hope to keep up with my monthly garden update but not stress myself by doing a lot more. Normal service will resume in September! This entry was posted in Uncategorized and tagged Catch and store energy, food from my garden, My garden design, Permaculture, Permaculture Diploma, Twelve principles for twelve months by emilycrofton. Bookmark the permalink.